We are now officially in 2018 and my first status update for my gold challenge is upon us. This week I have been running as many missions as I can on the app. 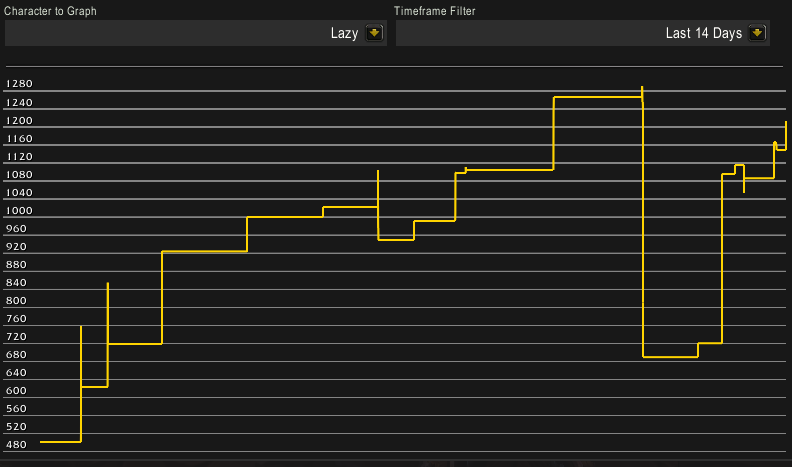 I have about half my followers at item level 925 on the demon hunter. We can see that my gold went down significantly on that account, but that was caused by me spending 160k on Orbs of Mystery to restock panthers. I managed to beat my last week in sales by hitting 936k this week! I am strongly considering increasing my alchemy prices as my flasks are selling extremely fast. I have trouble finding time to keep them stocked. I also restocked a lot of food this week, which as always has lead to really strong sales. I ended the week at a cool 1.2 million after spending a lot of gold on BoEs mid week. You can see that I was down below 700k after one of my shopping sessions! I had a pretty massive BoE sale this week. The Hulking Demolisher Legplates were item level 960. 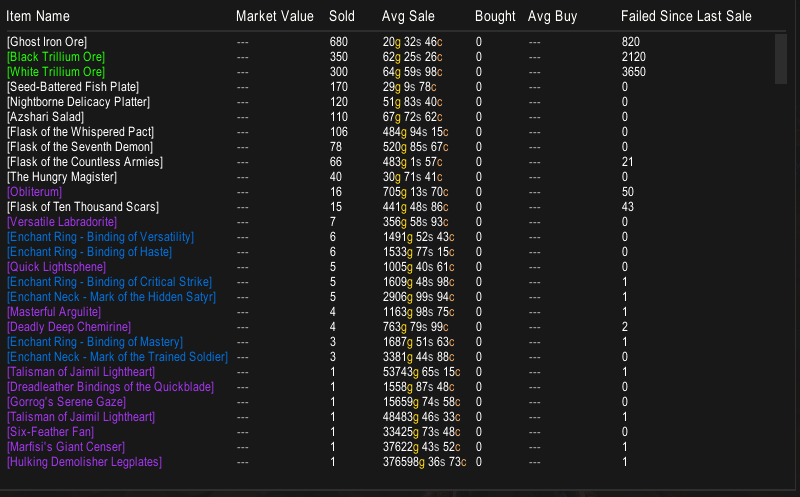 I purchased them for 300k, so in hindsight I probably could have sold them for more as they sold pretty much instantly. 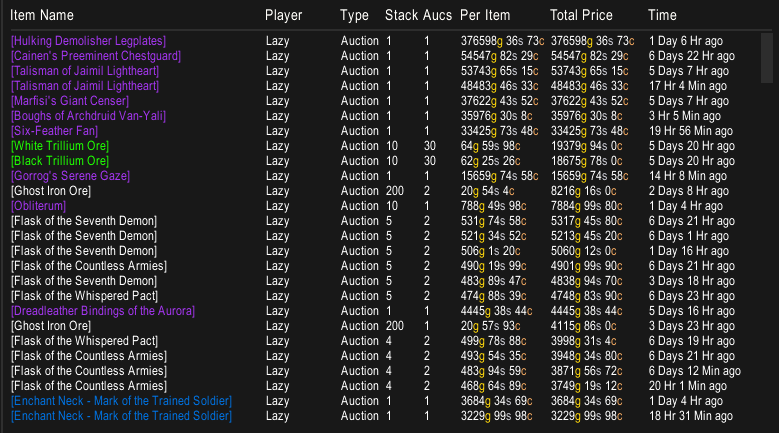 For very rare items you can be lead astray even using dbregionmarket as your price source in terms of eking out as much profit as possible. The rest of the sales are a bunch of lower ticket stuff. 101 BoEs still sell well, as do my flasks and the various materials I got from the Spirits of Harmony I purchased way back when. We can see that I managed to move a nice amount of Ghost Iron and Trillium this week. The prices for Trillium seem on the low side compared to the current price of spirits of harmony, so I will need to look at that. 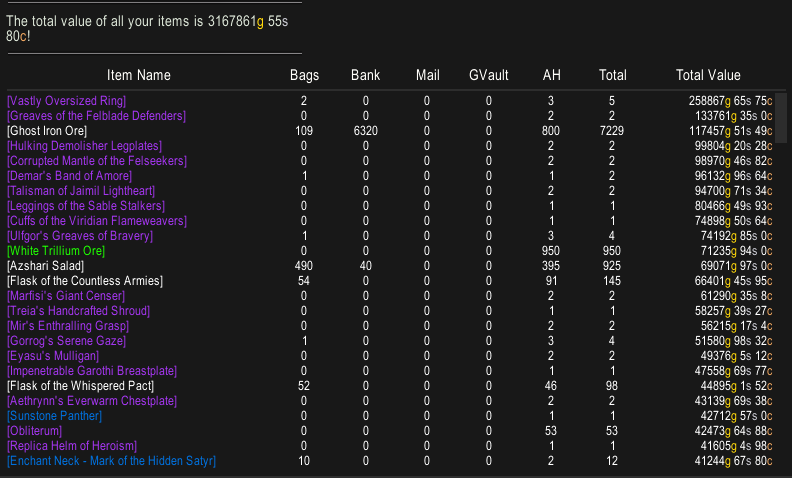 We can see that I managed to sell over 100 Flasks of the whispered pact, which is pretty damn good. It’s also very nice to see all the food back on the list. I only restocked it yesterday, but still a nice amount of sales since then. Getting materials for some of the crafts can be easier said then done, so I need to keep my scans peeled. Nothing much to say here this week either. The Black Trillium ore got moved of the top list after the sales the last week. In addition we have some food making a re-appearance together with the recently restocked panthers. I have been reading your blog with great interest over the past months. I have a few questions though. How do you restock your meterials for crafting. Like enchants or herbs. Do you use the same shopping operation as for meterials flipping ? (80%DbMarket) ? When crafting how can you be sure that you’ll make profit ? I know you’ve got your spreadsheet but it only works with current prices. If you’ve been restocking during the entire week it’s not relevant right ?